WASHINGTON (CNS) — In her last year of high school, concerned about the uncertain future that awaited her as a youth without legal documentation to be in the country, 17-year-old Claudia Quinones took her worries to her Maryland parish. “I was feeling very hopeless. I prayed a lot that day and I was asking God with all my heart to have some type of immigration relief. A few weeks later, DACA was announced,” recalled Quinones, now a college student in her 20s at a university in the Washington metropolitan area, referring to the Deferred Action for Childhood Arrivals program. The 2012 policy, popularly known as DACA, was implemented under then-President Barack Obama and while it does not provide legal status for youth who were brought to the country as children, like Quinones, it gives recipients a temporary reprieve from deportation and employment authorization in the United States — as long as the applicant meets certain criteria. 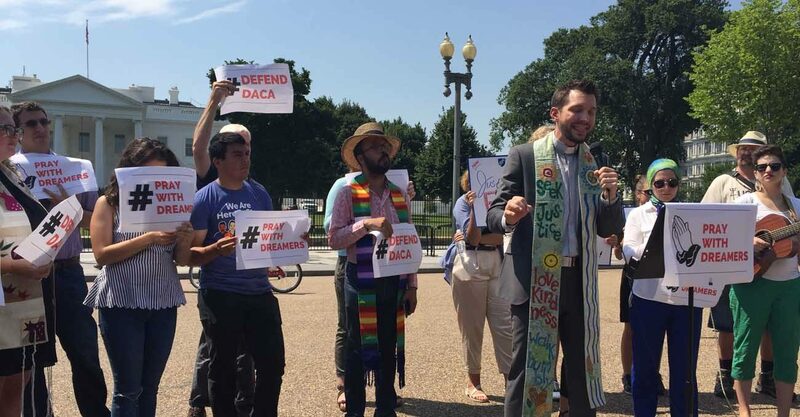 Quinones, joined by clergy, religious and laity of various faiths, prayed in front of the White House Aug. 2, spoke of the opportunities and contributions she other recipients have made, thanks to DACA. Catholics from organizations such Faith in Public Life and the Franciscan Action Network, members of the Sisters of Mercy and from Network, which is a Catholic social justice lobbying organization, joined religious leaders from other faith traditions in the summer heat, and publicly voiced their support of the program as tourists passed by the White House. They also called on others to join them for an Aug. 15 prayer vigil in front of the White House to mark the fifth anniversary of DACA, working to make sure it won’t be its last. More than 1,600 religious leaders from around the country have signed a letter sent to the Trump administration asking to keep the DACA program intact, she said. Trump campaigned on getting rid of the program but later walked back his position and said he was still thinking about what to do with the group referred to as “Dreamers,” who benefit from the DACA program. Mercy Sister Anne Curtis, who attended the rally, said that since her religious order is involved with education, she felt the need to attend “in solidarity.” The concern, however, goes beyond the students and other young people affected, she said, and extends to their families, as well as what the country will lose if DACA, as well as other programs, are terminated. “They’re great contributors to our society,” not just economically, but in what they bring to communities, said Sister Curtis. But DACA is under attack this summer as officials from nine states joined Texas Attorney General Ken Paxton in urging the Trump administration to end it, threatening the government with a lawsuit Sept. 5 if the program continues. A different group of 20 attorneys general wrote to the administration urging the president to keep the program. As summer nears, college and university administrators worry about the threat of the lawsuit and what it will mean for their returning students who still have no clear idea of what will happen to their only legal lifeline. Groups such as the Ignatian Solidarity Network are rounding up signatures for a letter from educators at Catholic high schools as well as colleges that is addressed to Trump’s White House Chief of Staff John Kelly, who until recently was in charge of the Department of Homeland Security, asking him to maintain DACA. Even with an uncertain future, only faith can get her through, she said, adding that she tries not to worry. So far, God has come through, particularly in that moment five years ago when her future seemed bleak, she said. “When I got DACA, life changed completely. It seemed that everything worked out,” she said. Her relatives worry because after speaking out in favor of DACA, she’s been placed on a list asking the government to deport her. But she said she finds support in the groups like the one who stood with her in front of the White House. To start with they aren’t KIDS! So misleading. You can sign uo forDACA up to 31 years old. It is NOT the United States responsibility to change the Law and the Constitution for illegal aliens. It is also not the responsibility of taxpayers to financially support, educate citizens of other country’s. 30% percent of all Federal Prison inmates are illegal aliens. Does not include local jails and State Prisons. At 21,000 per year expense per inmate in Federal Prison—do the math. *$12 Billion dollars a year is spent on primary and secondary school education for children here illegally they cannot speak a word of English. *$17 Billion dollars a year is spent for education for the American-born children of illegal aliens, known as anchor babies. *$3 Million Dollars a DAY is spent to incarcerate illegal aliens. *$2.2 Billion dollars a year is spent on food assistance programs such as SNAP (food stamps),WIC, & free school lunches for illegal aliens.